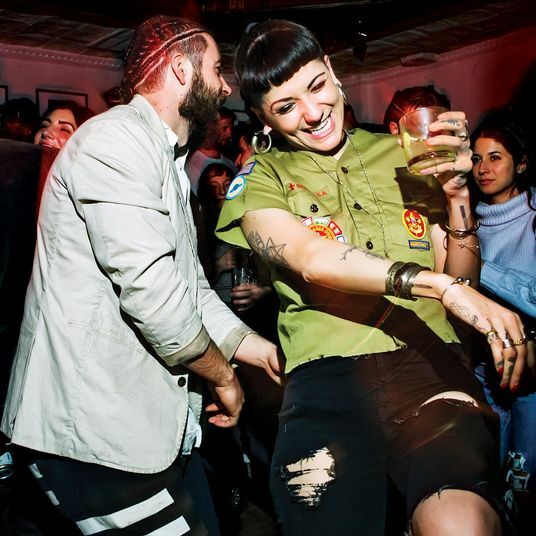 With a significantly older population than most of Manhattan, the Upper West Side isn’t a place for fast-walkers and trendy downtown mishegoss. It’s hell if you’re in a rush. But slowness is a boon for dinner. 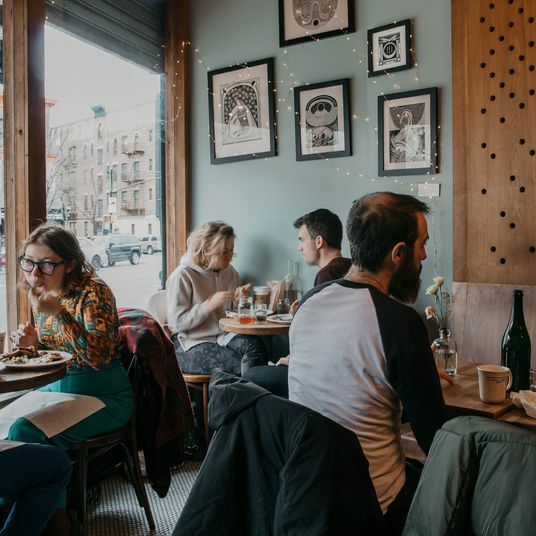 The best of the Upper West Side’s restaurants combine comfort and leisure, administering to the not exactly cutting-edge but rarely dull tastes of its Advanced Style citizens, as well as to the Old Souls in search of a hotsy-totsy swell time. 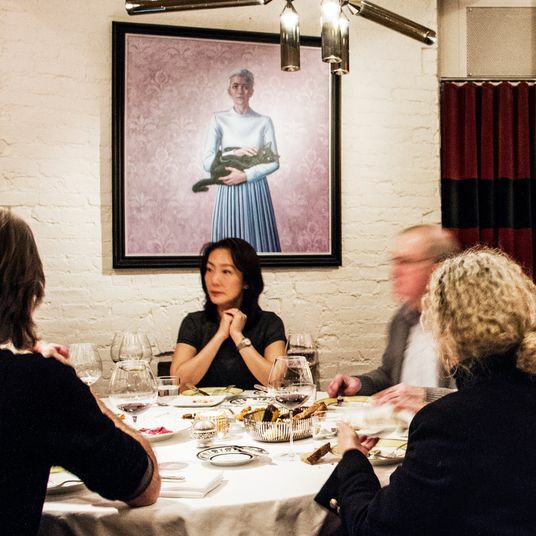 Like a Montrachet or a Sagrantino, a truly great Upper West Side restaurant must have deep roots in its terroir. It is not an offshoot or a clone, and so no matter how wonderful the Mermaid Inn or the Ribbon, for instance, might be, for these purposes, they are hors concours. 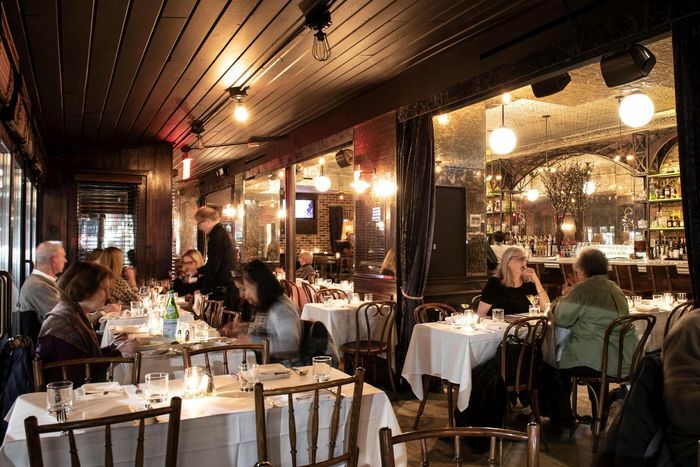 Here, the very best restaurants on the Upper West Side. 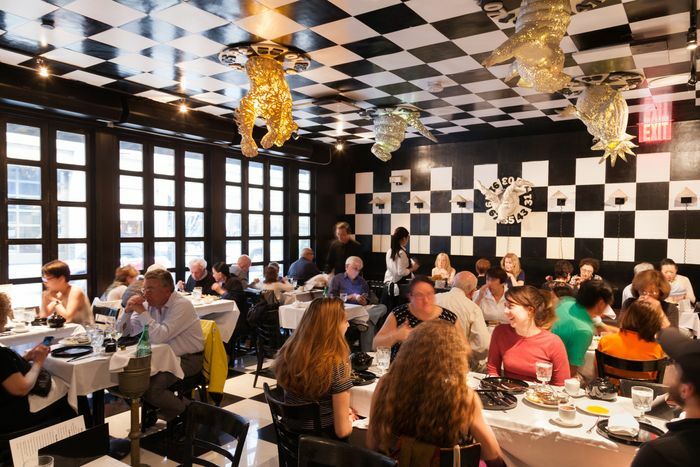 In a well-appointed ground-floor dining room that used to be John Fraser’s Dovetail, longtime Marc Vetri protégé Adam Leonti delivers his Northern Italian cuisine in what looks like an Art Deco/Pop Art/Salon del Mobile installation (the design was heavily influenced by Ettore Sottsass’s famous 1980s Memphis Group). The neighborhood synergy makes sense. Bergamo, where the young Leonti once lived, is the Upper West Side of Italy: plush, lush, and opulent. As is the food. Beef-bone broth arrives in a delicate Ginori porcelain cup. Béchamel replaces red sauce in a Roman artichoke lasagna, basically an artichoke in a pasta costume. A tortellini pie — veal meatballs, bolognese, mortadella-stuffed tortellini — is equal parts Medieval Times and GBBO. Though there’s no red sauce here, the sourdough-battered chicken in pastella may just be the best fried chicken in the city. It’s impossible to leave un-full or unsatisfied. When Tom Valenti closed Ouest in 2016, hair shirts were donned and laments rose to the heavens. The neighborhood bistro was no more. Cue the renaissance tune. Valenti is back with a bistro he calls the Oxbow Tavern. But he’s not fooling anyone. This is more Paul Cézanne than Thomas Cole. During happy hour, he does brisk business in gaufrettes and gougères at the bar, incidentally the longest zinc bar in Manhattan, And the menu is AP Bistro. A coq au vin is offered as dark as night, the chicken-liver mousse as light as air. Valenti gussies up a normcore frisée salad with plump moules. He dusts porcini on cod, and is generous with the lobster that studs his gnocchi. And if there’s any chance that duck gizzards and braised tripe can make it on the Upper West Side, this is their best shot. It’s been close to 40 years since Michael Tong opened this Lincoln Center offshoot of his upscale East Side Chinese restaurant, Shun Lee Palace (and that’s long enough for us to make an exception to this list’s no-spinoffs policy). The sense of time is both seductive and deceiving. 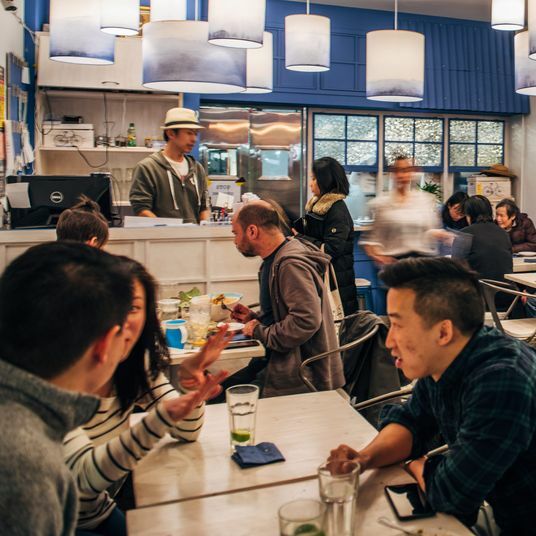 There can be little doubt that the restaurant — with its bow-tied and vested waitstaff, glowing dragons, and elaborately folded napkins — speaks to another era, when knowledge of Chinese regional cuisine was limited by the fact that most Americans weren’t aware China had regions. At the same time, even in 1981, Tong was channeling the ancient flavors of Yangzhou, Sichuan, and Shanghai, and those delicate balances found in the push-pull of hot-and-sour soup, for instance, or the mellow sweetness of red-cooked short ribs, Hangzhou–style. Lucknow, the capital of Awadh, the state in Uttar Pradesh from whence Gaurav Anand draws culinary inspiration, is renowned for its transcendent taste. In the 18th century, Lucknow was the seat of the Nawabs, an aristocratic bunch whose love of luxury was so great they lost all of their teeth, which — good news for us — resulted in the development of the galouti kebab, a patty of leg of lamb, minced six times and then tenderized with papaya and mixed with masala. 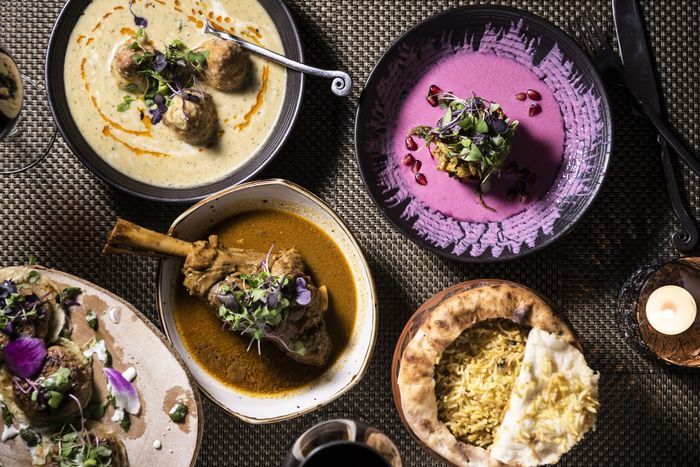 At Awadh, Anand’s bi-level restaurant on Broadway, the lamb is as tender as the night, manna for the toothless. Among the other revelations at Awadh is dum pukht, a genre of cooking wherein the protein is sealed under a layer of naan, immersed in clarified butter, and cooked slowly. What goes on under there is alchemy, as dishes like Sufiana murgh biryani, a mixture of creamy chicken and aromatic basmati rice, handily prove. Balletomanes and boldface names (and Bob and Barbara and everyone else you know) meet at Lynn Wagenknecht’s excellent bistro. 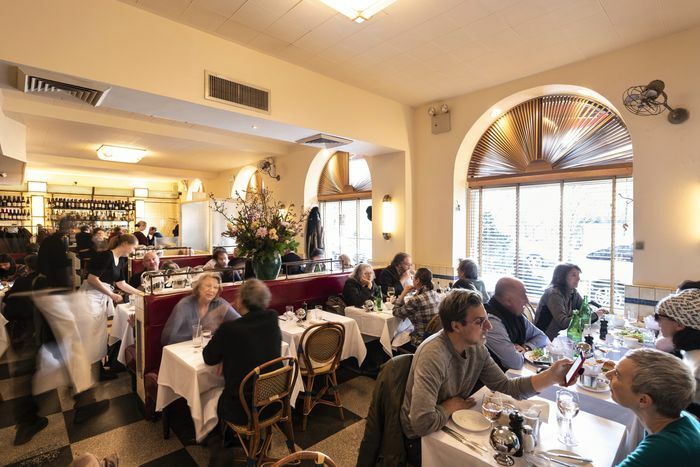 Café Lux, to regulars, belongs to the proud lineage of West Side French spots like La Caravelle and Le Poulailler (and Le Quercy and too many too long gone to name). 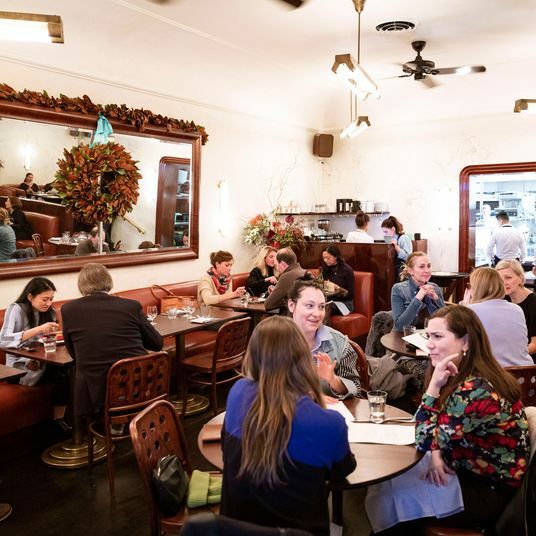 The 90-seat restaurant, on 70th, buzzes with a 1980s New York energy extruded through 1920s Paris. The menu reads like a Sondheim revue of bistro classics, but the greatest hits here are truly great: a perfectly executed steak-frites with an exoskeleton of char, a silky au poivre sauce, and salty fries; garlicky moules marinières; and a crock of French onion soup that, like the aproned waiters, has a warm heart under a crusty exterior. 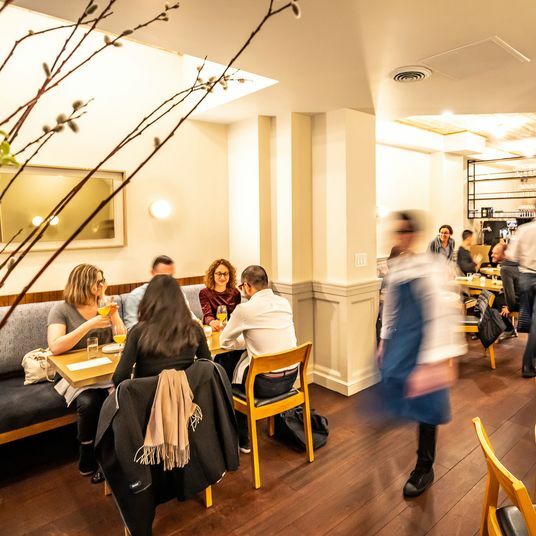 The Lyonnaise chef Daniel Boulud is a shape-shifter: stuffy on the Upper East, transactional in midtown, and here, in the Upper West Side, pure comfort. 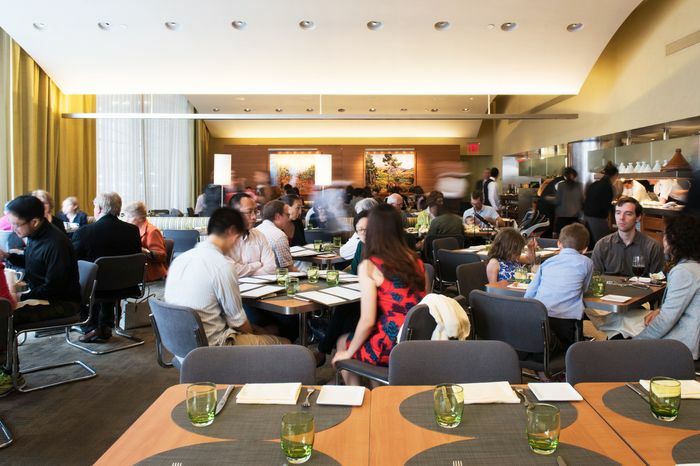 The space at Boulud Sud — gently curved ceiling, colorful banquettes in harlequin stripes, white tablecloths — radiates monied calm. 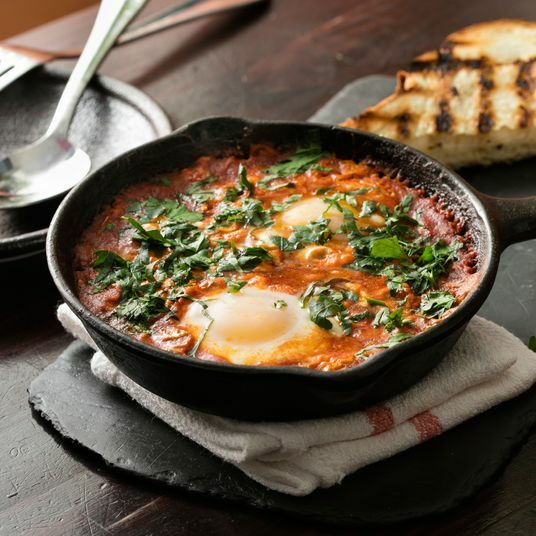 The menu, which spans from Arabic flatbread to Ibérico ham, is like a Carnival Cruise calling on all Mediterranean ports. Executive chef Travis Swikard is as at ease with the muscular flavors of octopus a la plancha as he is with balancing the subtle flavors of a spring-pea risotto with Maine lobster and lemon verbena. And then there’s Absolute Bagels, the only bagel store worth the line. Let the fancies have Black Seed and Sadelle’s. Absolute Bagels is a filthy little store with sublime bagels. 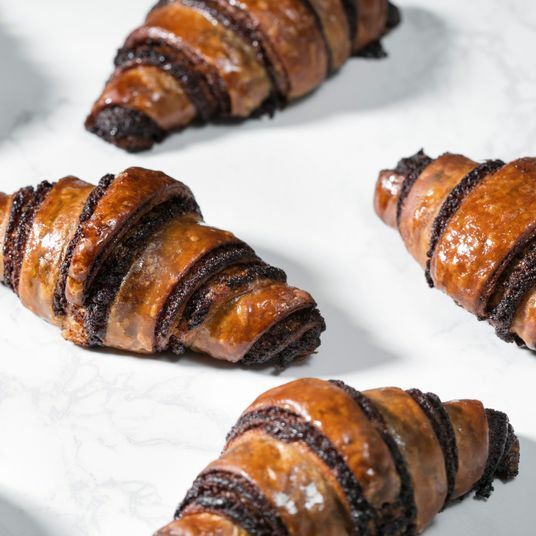 Owned by Sam Thongkrieng, who emigrated from Bangkok in the 1980s, Absolute channels the recipes of yesteryear (Thongkrieng learned his craft at Ess-a-Bagel) to form bagels of both ineffable softness and satisfying crunch. Their outsides are substantial but ultimately yielding. Their interiors are soft and voluptuous. As for the coffee — the Abbott to a bagel place’s Costello — it is widely understood as a waste of time. Go with a Thai iced tea and a fresh egg bagel. 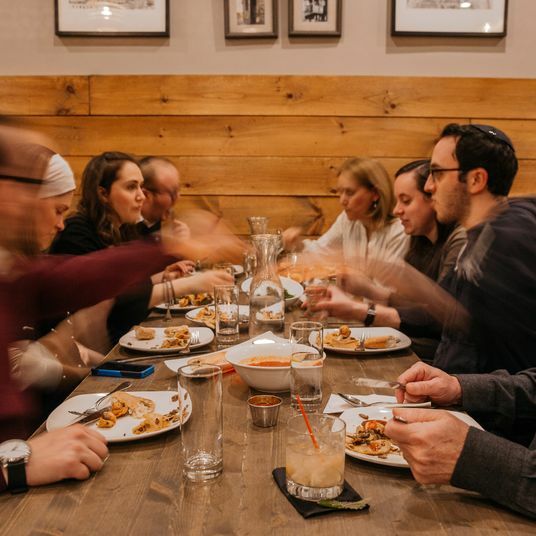 Delicatessen, the art of making tough meat tender, is alive and well at this sliver of a kosher restaurant on West 72nd Street. Though often unjustly overlooked in the mourner’s kaddish frequently recited over Great New York Delicatessens, this 90-year-old institution quietly doles out towering pastrami sandwiches, tender kreplach, and the elusive tongue polonaise (tongue with a sweet-and-sour raisin sauce) in a no-nonsense dining room where walkers more often than not crowd the linoleum floor. Easy to miss until you walk through the narrow hallway and the world opens up to you, the Milling Room is a giant, overlooked jewel of the Upper West. 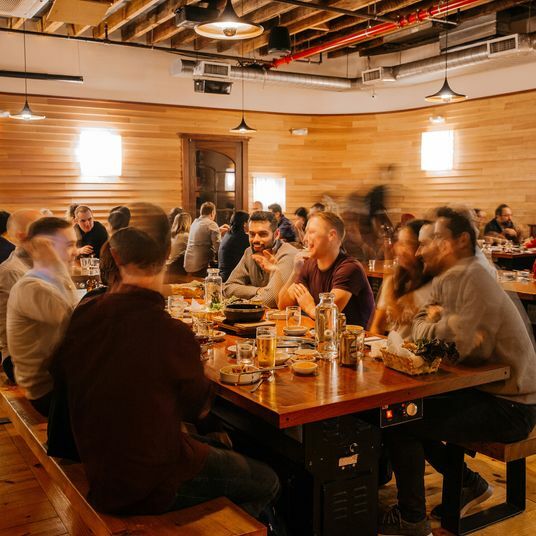 The restaurant, which opened in 2014, occupies the former Palm Room of the Endicott Hotel, a soaring, skylit space that’s easier to fill with light than with people. But I’m not sure how many patrons know about the almost ridiculous pedigree of chef Phillip Kirschen-Clark (Ducasse, Dufresne, Liebrandt). His studied hand, however, makes itself felt in quietly bold choices that enliven the modern American menu: wild mushroom risotto dusted with cotija and drizzled with balsamic vinegar; a cameo of pickled ramps atop a silken celery-root soup; spicy vongole bucatini with Thai chile and miso. Like at a Just Salad for the ballsy, diners approach the counter at this Sichuan-by-way-of-Flushing fast-casual joint to contemplate an array of options. Will it be pig’s ear, sliced into ribbons like meat fettuccine? Or thin slices of fatty beef? Perhaps shrimp balls or squid balls or duck feet? The spread is astonishing. 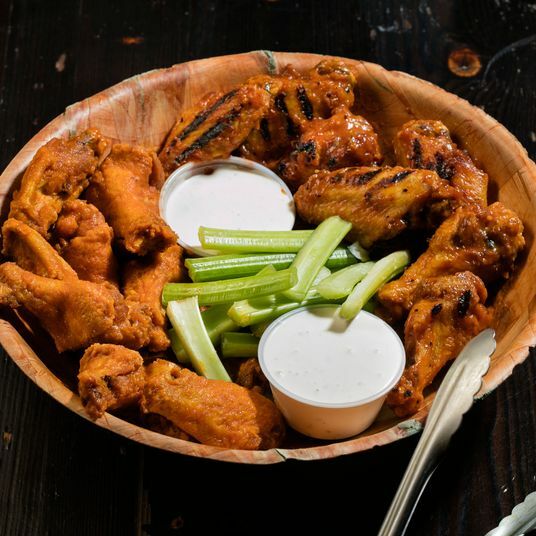 Choose a number from 1–100 (20 is mild; 40 is spicy; 60 is hot; 100 is insane). 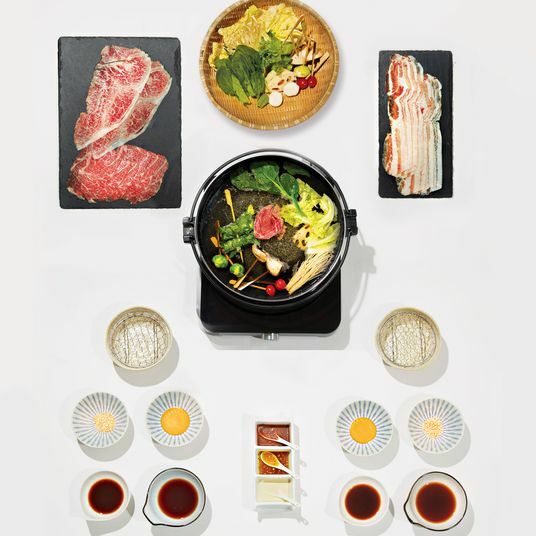 Weighed in a bowl, these ingredients are then whisked into a kitchen in the back and emerge, mere minutes later, as a delicious dried hot pot. The restaurant — no relation to René Redzepi’s 108 — is the first one devoted specifically to the Chongqing municipality in the city. It wisely opened near Columbia, where the highest percentage of international students are from China. On a recent afternoon, the bric-a-brac space was full of students staring at their phones, slurping glassine noodles, and thinking of home. 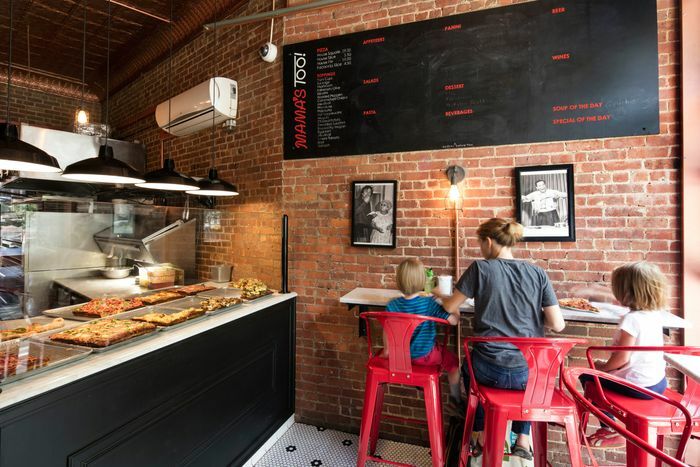 Much hay has rightly been made of the square pepperoni slice at Mama’s Too!, the offshoot of Mama’s, a mainstay of slice culture a few blocks south. And rightfully so: That slice — crust hard; inside tender, airy and open — is like a Clint Eastwood character. The joy is in the physics of heat and meat. The thick-cut slices of pepperoni turn into little cups that hold drops of precious grease, glistening like pork nectar. “Little amaryllis of meat,” said a friend, who works at a nearby flower shop. But there’s more slices at Mama’s Too!, and if you can’t wait in the pepperoni-slice-only line, you’ll want to avail yourself of these. Among them are the house slice, grated post-oven with two-year-old parmesan and sprinkled with a greenhouse’s worth of basil, and the Angry Nonna, made spicy with Calabrian chile oil and soppressata, and sweet with honey. 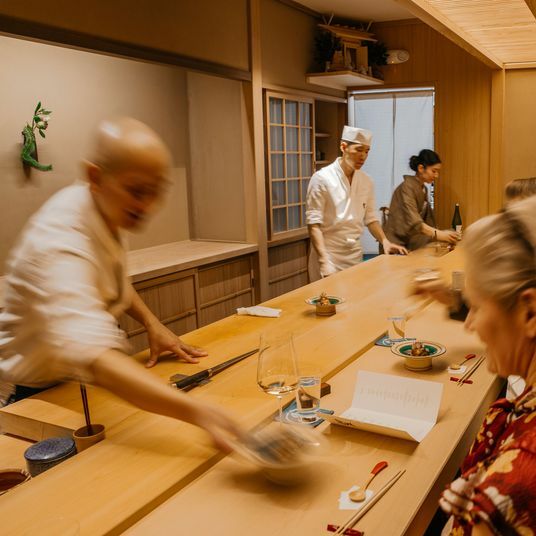 During the three nightly seatings at this tiny, crazily affordable sushi-ya owned by Yoko Hasegawa, there are but 12 people and then the rest of the world. 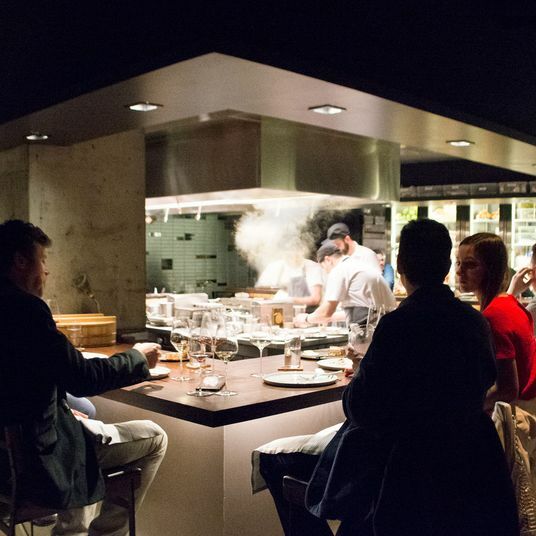 The menu, a choice between a 12- and a 16-course omakase, leans heavily on nigiri, a sushi high-wire act. Fish. Rice. Basta così. With little room to maneuver, Hasegawa et al. rely on virtuosically prepared product, from silvery iwashi (Japanese sardines) and tuna otoro, to ikura (roe) cured in-house and a tangle of uni tongues from Hokkaido. These small bites are often accompanied by only a touch of homemade soy sauce or exotic salt. And, after a long dry spell, sake is now available. 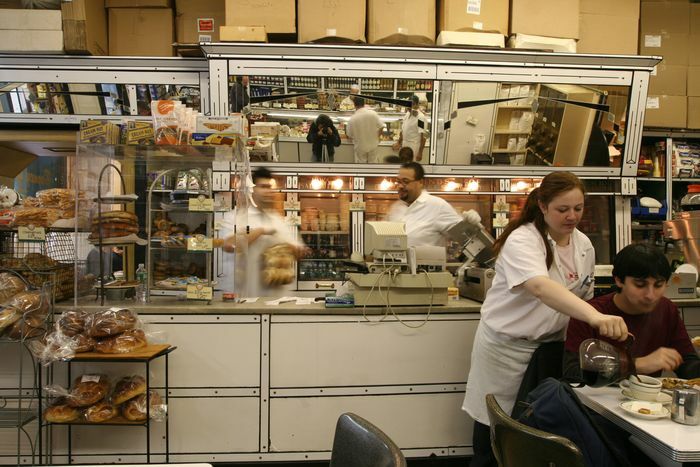 Munificent and nebbishy, a portrait of Barney Greengrass, the original Sturgeon King, keeps watch as a brisk trade is done in Jewish appetizing: silken sheets of nova, sturgeon, chubs, whitefish, sable. Thus has it been for the last century at this Upper West Side institution. No less august a man of letters than Philip Roth extolled the virtues of the lox, eggs, and onion, which the writer called “more American than apple pie.” That holy trinity — fish, allium, zygote — has, for years, been an icon of the old Upper West Side, a beacon to which the madding crowd draws every weekend morning for the click-clatter of an old New York brunch. Remus had Aventine; Romulus had Palatine; Barney has Amsterdam; and Murray has Broadway. So the great sturgeon wars of the Upper West Side have panned out. 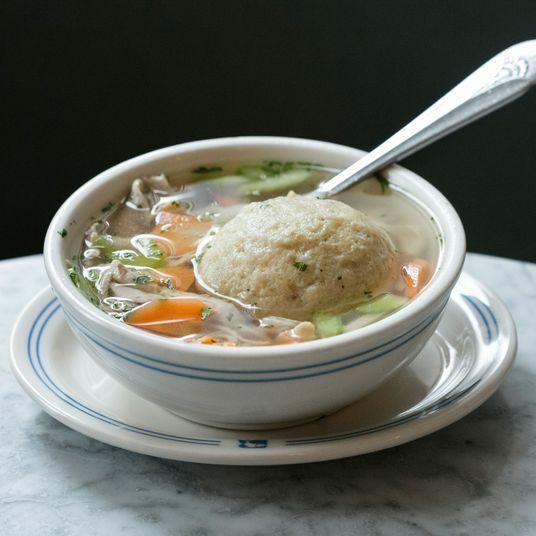 Smaller than Greengrass, Murray’s Sturgeon is strictly a takeaway operation, but no less a marvel of mid-century Jewry. In this narrow shop, the walls are ancient tile and the clock works, but, nonetheless, seems stuck in the 1960s. The sturgeon, however, is golden, the schmaltz herring properly cured, and the salmon as silken as a lullaby. Now on its third owner, a guy named Ira, Murray’s continues to shine, smaller but no less brilliant. 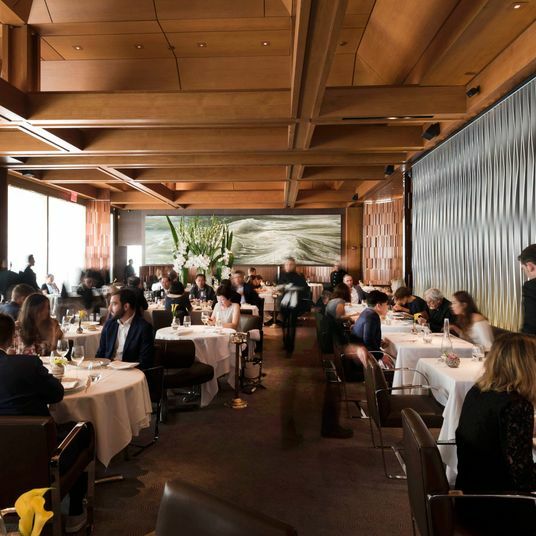 Culinarians in the know may be familiar with Daniel Boulud’s Skybox, a four-top tucked above the kitchen at his flagship, Daniel. More democratic but no less a wonder is the 74th Street Cafe & Steakhouse, an anomalous oasis of calm and extremely satisfying chicken-salad sandwiches on the second floor of Fairway. 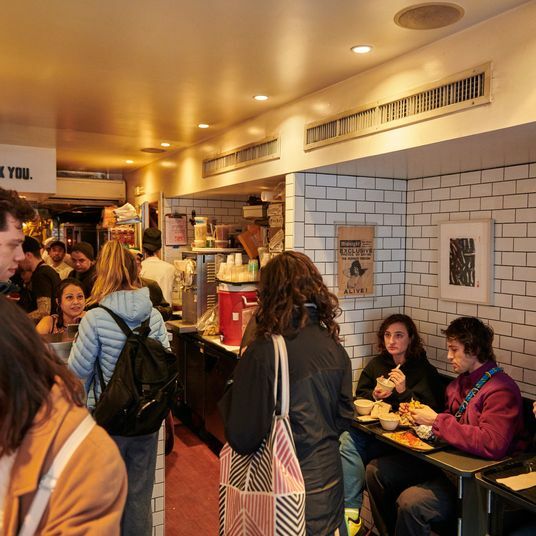 Since it opened in the early aughts, the cafe has drawn from the shelves during the day (silver dollar pancakes, tuna melts) and the meat counter at night (skirt steak Toscana, beef Wellington with foie gras, a panoply of burgers). Like a swan, it glides above the furious action (and jostling old ladies) of the supermarket below. With its garish colors and hard surfaces, the corner that houses Gray’s Papaya may seem like strange shelter from the storm. 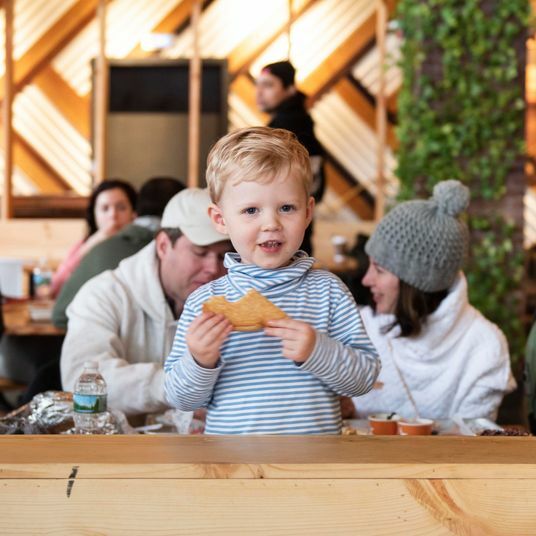 But for 40 years, for 24 hours a day, among the snappy hot dogs and frothy papaya drinks, Gray’s Papaya has given New Yorkers (and temporary New Yorkers) a place to stand and watch life go by. 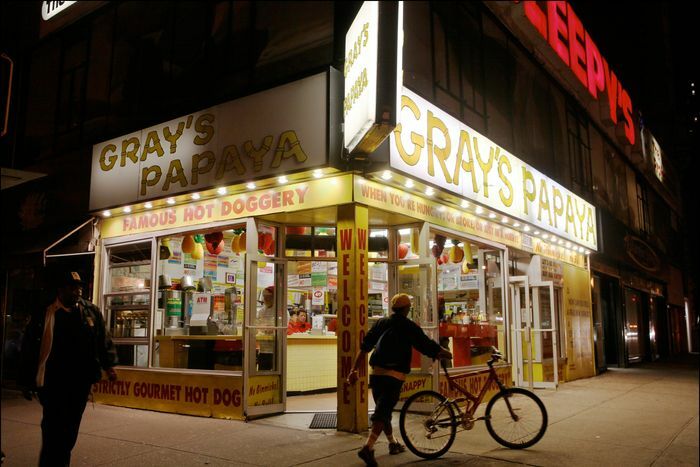 Though future scholars may debate the true victor of the hot dog wars — an argument can be made that Papaya King reigns supreme — Gray’s famous Recession Special (now two hot dogs and a drink for $6.45), first introduced in the 1980s, is as delicious as it is — sadly — eternally timely. Geodes form in small spaces. They often appear as ordinary rocks, yet, broken open, reveal true beauty. 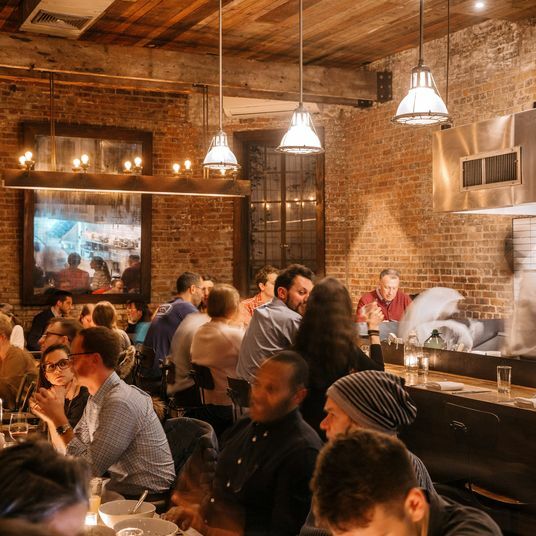 The neighborhood Italian restaurants that dot the Upper West Side — Bettolona, Pizzeria Sirenetta, Bella Luna, to name a few — are geodic in this regard, perhaps none more so than Celeste. 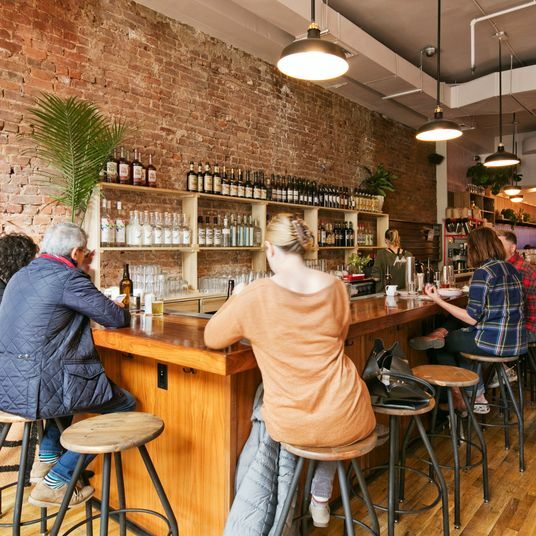 For over ten years, the unfussy Neapolitan spot has been presided over by owner Carmine Mitroni, a man as incandescent as a chandelier. 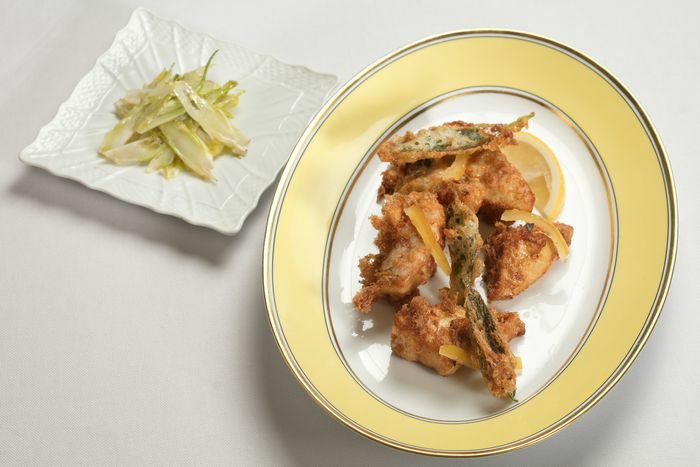 Anything that comes out of the fryer is golden: carciofi, fritto misto, ricotta balls. In a pizza-mad city, these pies rival anything eaten in the shadow of Mount Vesuvius. And the tables, though hard to come by, turn often. Before there were juice bars and millennial cleanse joints — like, waaay before — there was Ayurveda, an ancient Hindu medicinal system. At the Ayurveda Cafe, owned by legit Indian movie star Tirlok Malik, fully vegetarian set meals called thali, in which each element is calibrated to interact according to Ayurvedic principles, are served to local vegetarians, Buddhists, Jubus, hippies, and the hungry. A typical meal might include banana pakoras, mung daal, alu gobi, fresh pappadam, and broken wheat kheer. The space is akin to a more enlightened Shopsin’s: handmade, idiosyncratic, with lots of handwritten notes, but perhaps a few more sculptures of Ganesh.